Actress and activist Jamie Brewer has been named the recipient of the 2015 Quincy Jones Exceptional Advocacy Award by the Global Down Syndrome Foundation. She will accept the award at the 7th annual Be Beautiful Be Yourself Fashion Show at the Colorado Convention Center on October 24, 2015, in Denver, CO. 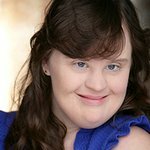 Brewer, who has Down syndrome, is best known for her roles on American Horror Story. She has played three different characters (Adelaide, Nan and Marjorie) alongside actress Jessica Lange on the award-winning television series which returns for a fifth season this fall on the FX network. Brewer made history earlier this year as the first model with Down syndrome to ever walk the runway at New York Fashion Week for designer Carrie Hammer. She also served on the ARC Governmental Affairs Committee for the state of Texas to represent individuals with disabilities where she was the only person out of 17 representatives who was differently-abled. “I am honored to accept this prestigious award from the Global Down Syndrome Foundation, and proud to be acknowledged for my advocacy work as a role model for people who are differently-abled,” stated Brewer. Each year, the Global Down Syndrome Foundation presents the Quincy Jones Exceptional Advocacy Award to outstanding role models who tirelessly advocate for the rights of the differently-abled. Past award recipients have included Quincy Jones, Jamie Foxx, John C. McGinley, Beverly Johnson, Kyra Phillips, Tim Shriver, and Patrick Kennedy. The Global Down Syndrome Foundation’s annual Be Beautiful Be Yourself Fashion Show is the largest fundraiser for Down syndrome in the nation attracting more than 1,200 guests each year. The celebrity gala has raised $9.5 million for Down syndrome research, medical care, advocacy and education. Moreover, it has raised widespread awareness for the alarming disparity of funding for people with Down syndrome while successfully emphasizing their abilities. This year, actor Terrence Howard will join a host of celebrities escorting models with Down syndrome at the fashion show. Past celebrities have included Jamie Foxx, Alec Baldwin, Helen Hunt, Laura Dern, John C. McGinley, Beverly Johnson, Jeff Probst and Quincy Jones, among others. For more information, visit www.globaldownsyndrome.com.